State Rep. Dawnna Dukes announced her retirement in September, but doesn't plan to make it official until Tuesday. That would make her annual pension payout $3,220 bigger. As Texas lawmakers clock in for work on Tuesday, the first day of the 85th Legislative Session, one of their longtime colleagues is expected to call it quits. State Rep. Dawnna Dukes, a Democrat, announced in late September that she planned to retire after more than two decades, but that she would not officially leave until Jan. 10. Critics, including those hoping to replace her, point out that such a delay will leave Manor, Pflugerville and parts of Austin without representation for most of the legislative session as a special election cannot be called until she officially resigns. Why wait to resign? 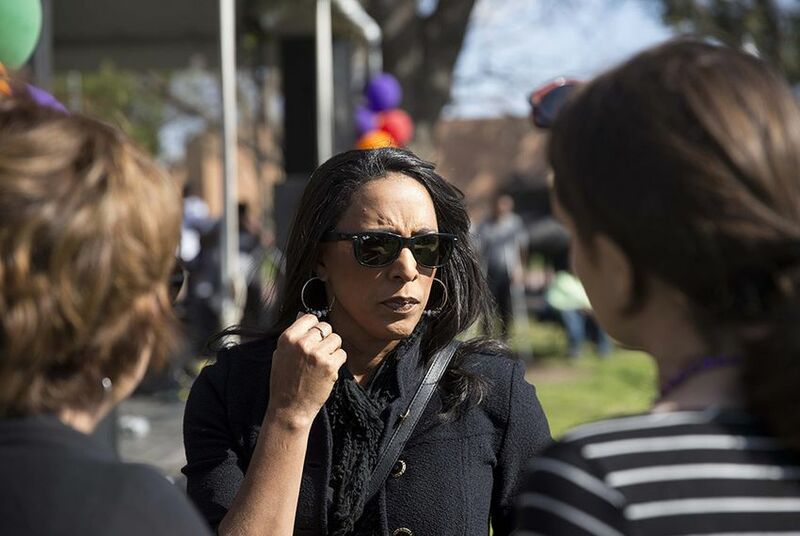 Dukes, who is under criminal investigation by the Travis County District Attorney’s office amid allegations that she misused staff and government funds, won’t say. What is clear, however, is that the move will add $3,220 per year to her state pension. The delay highlights a quirk in the way Texas calculates its often generous benefits packages for retired lawmakers: They can get credit for an extra year’s service without even taking a vote. Because the Legislature is a part-time gig in Texas, its members don’t get paid much while they are serving. They take home a base salary of $14,400 every two-year legislative period, plus $190 each day the body is in session. That’s $41,000 over two years during regular sessions. Retirement can prove more lucrative. Dukes, 53, could immediately collect a $74,060 annual pension, according to a state formula for calculating the benefits (That’s assuming she resigns when expected. Gov. Greg Abbott has yet to receive her resignation letter, a spokesman said Friday). The formula, which uses the minimum salary for a district judge, goes as follows: $140,000 x .023 x years of service. Dukes took office in 1995, but the state’s formula would credit her for 23 years of service — simply for serving any day in 2017. Elected officials can establish a “service credit” for “all or part” of any calendar year during which they held office or were eligible to take the oath of office, according to the Employees Retirement System of Texas. So Dukes’ 10 days in January would boost her annual pension by $3,220. Dukes did not respond to interview requests, and Bill Miller, a spokesman, did not respond to a list of questions about her motivations — other than to confirm that she still planned to resign on Tuesday. “She won't be answering questions prior to that date,” he wrote in an email to the Tribune. Dukes has said she’s retiring because of parenting demands and health concerns following a 2013 car crash that left her absent during most of the 2015 legislative session. But her announcement came amid a whirlwind of ethics questions. Former staff members accused Dukes of seeking reimbursement from the state for travel payments she was not entitled to. And in February 2016, the Tribune reported that the state auditor’s office was investigating her use of state workers for personal projects. In April, the Texas Rangers joined a criminal investigation into Dukes’ behavior and presented their findings to the Travis County District Attorney's office, which is still reviewing the case. Meantime, Dukes’ name remained on the ballot during November’s general election, and voters overwhelmingly picked her for another term. A host of candidates are lining up for the race to succeed her — whenever that might be. Once Dukes offers Abbott her resignation letter, the governor has 20 days to announce a special election date, which could be anywhere between 21 and 45 days after that. If those results are close enough to force a runoff election, choosing Dukes’ successor would take even longer — eating up most of the regular legislative session, which concludes at the end of May. That makes the candidates worried. Others who have discussed running for the seat include Gabriel Nila, who teaches at-risk kids and unsuccessfully ran for the seat last year as a Republican; Sheryl Cole, former Austin mayor pro tem and city councilwoman; and Kevin Ludlow, who runs a software firm and ran for Dukes’ seat last year as a Libertarian. Vela said he wished the Democratic Party had publicly called for her to step away earlier, preventing the lengthy special election process. Manny Garcia, the party’s deputy executive director, said Democrats hope that “when any vacancy occurs, Governor Abbott takes the representation of Texans seriously and swiftly moves to ensure it is quickly filled."